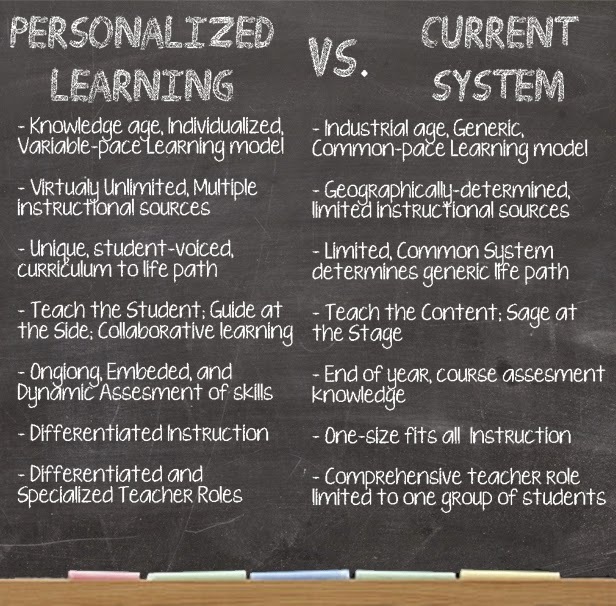 Learning NEXT: Personalized learning, standardized tests: Stop "reforming"
Personalized learning, standardized tests: Stop "reforming"
This past August Ian Altman published a piece in The Washington Post. It was recently shared again on Facebook by my colleague Tom Whitford. I started to just share it, but realized I had a few other things I wanted to say about it. In Seven things teachers are sick of hearing from school reformers, Altman calls out the likely well-meaning but generally misguided and misinformed individuals who may or may not intentionally challenge not only the professionalism of teachers, but their intelligence and their competence. Most of our teachers are good teachers, even excellent teachers. We have a tendency in the US to paint everything with a broad brush, so if one school isn't doing well, the whole district is cause for alarm. If one district has failing grades, the entire state is convulsed with angst. For the past couple of years, when occasion has permitted, I've asked educators to consider the number of initiatives in their schools and in their districts. I've suggested they do an audit of the initiatives launched over the past few years. One district I worked with did such an audit and was astonished to discover the number of school, district, and state initiatives launched and subsequently ignored or countermanded or contradicted by additional initiatives. They soon discovered that most teachers acknowledged the initiative, followed what they needed to in most cases, and just ignored the rest. Many of us have been talking about the need for patience when any change of policy or practice is introduced. But far too many have unrealistic expectations for change in schools. A superintendent wants to see change by the end of a school year, no matter what. Her job or his legacy may depend upon it. If change doesn't seem to occur fast enough, additional changes are forthcoming and those only serve to slow down any progress or muddle it. So when school reformers come knocking on the schoolhouse door with their so-called research and the push for data analysis to make good decisions about how to teach a child, the majority of teachers want to tell reformers to take a hike. Why? Because what most reformers don't realize is that the really good teachers and the best of our teachers do all kinds of "assessment" during every single hour of every single school day. They might not see every sign of every kid every time, but they work hard to get to know their kids. They spend long hours on their own finding new strategies or new activities that will help their kids learn. They recognize when they've designed a bad test question and adjust accordingly. They don't need no stinkin' data-driven decision-making nor standardized tests to know which kids are struggling. They don't need formal policies to figure out why most of their kids are struggling in particular areas. In fact, they really don't need the stranglehold of excessive policies and practices that mostly interfere with their ability to do their jobs, and they really don't need to hear about bloated and condescending research from individuals who have spent little time in actual classrooms doing actual teaching with actual kids. I believe most school reformers mean well, but I wonder why in the world they seem to insist on the broad brush approach when so much about a school is individual. We laugh when we talk about principals who think their schools are unique, and yet, they're right to think their schools are unique. Sure, many grade level schools share the same kinds of problems because they have elementary, middle, or high school students. But the demographics are different; the personalities and the capabilities of their teachers are different; the backgrounds of their students and their students' families are different. What is so fabulously contradictory and ironic about education is that we are currently riding the wave of personalized learning. Many of our reformers who were or are staunch supporters of standardized tests are also or have become passionate cheerleaders for personalized learning. Um, is it just me or does it seem odd that we would encourage students to pursue personalized learning and then expect them all to take the same exact exam? In other words, once again, we have a weird confluence of policies and initiatives that confuse whatever it might be that reformers might have been trying to do. Teachers have every right to be weary of so-called reformers, most of whom haven't been in a K-12 classroom since they were kids or since they went to their last parent-teacher conference, and neither of those count. Every time I get to be in a school with a group of educators, I get to spend time with some outstanding teachers as well as some teachers who are probably pretty good at what they do in the classroom. I am always impressed with what teachers can do in spite of everything. I'm not saying we don't need some changes in our schools, but, again, a broad brush approach to impose the same changes on all teachers in all schools is absurd. People wail and wring their hands over standardized test scores even though many of our teachers, because of other stupid policies, have been forced to become proctors to prepare students to pass a test rather than actually teaching them. And we wonder why our kids aren't ready for college.